Once you have costed the viral hepatitis programme, you can then create the investment case. There are two types of analysis, a cost-effectiveness analysis and a cost-benefit analysis. These analyses can be used to help you make adjustments for programme efficiency or justify investment in a programme. A cost-effectiveness analysis provides information on the costs of improving health by means of a particular intervention and looks at the cost and effectiveness of that intervention only. An indicator of this analysis is an Incremental Cost-Effectiveness Ratio (ICER) which looks at the additional cost of expanding or introducing a particular intervention divided by the additional health gains that would result. A generic measure is used to determine the effectiveness of an intervention and this is usually one of the below options. Further information on how to calculate DALYs can be found on the WHO website here. QALYs gained: quality-adjusted life years measure the state of health of a person or group in which the benefits, in terms of additional length of life, are adjusted to reflect the quality of life. It is used in an economic evaluation to assess the value for money of medical interventions with one QALY equating to one year in perfect health. A year lived in a state of less than perfect health is given a value of less than 1; this is its utility value. To determine the QALY the utility value is multiplied by the number of years lived in that state. Lys: life years gained measure the additional number of years a person lives as a result of a health intervention. It measures only mortality. While DALYs are the preferred measure of the World Health Organisation, both QALYs and DALYs give a more comprehensive measure of population health than looking at just life years gained. The outcome of a cost-effectiveness analysis can be used within the health care system when making decisions regarding financing programmes and reallocation of resources as it gives a generic measure which can be compared across programmes. As part of this decision-making process a cost threshold needs to be established above which an intervention is determined to be too expensive. A positive cost-effectiveness ratio below this threshold is determined to be cost-effective while a negative cost-effectiveness ratio is cost-saving. Typically in developing countries the threshold used is GDP per capita and in developed countries three times GDP per capita. 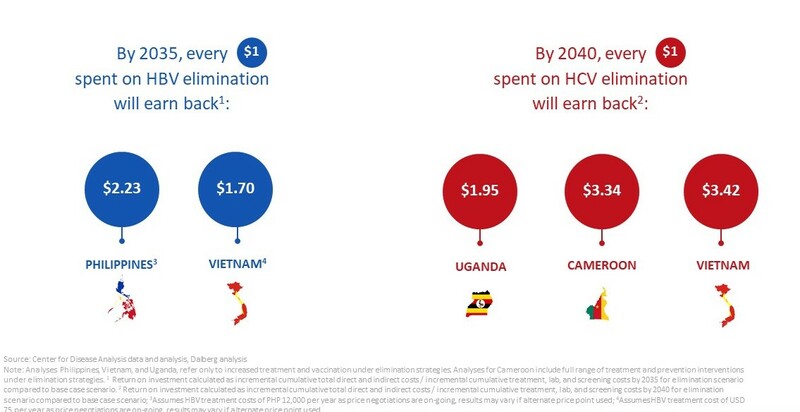 Reallocation of resources from other programmes to viral hepatitis can be a highly cost-effective measure in the long term especially as liver cancer and cirrhosis caused by viral hepatitis may be a significant health cost. Where reallocation is not feasible or appropriate, this analysis can act to guide decisions on where future increases in health spending should be allocated. The second analysis is a cost-benefit analysis which is also known as an investment case. This is a broader analysis which takes into account both direct and indirect costs and benefits and so it looks beyond just the health outcomes. The outcome of a cost-benefit analysis is a monetary value which shows return on investment and so it creates the business case for the hepatitis programme. The investment case can be used as a decision-making tool with a broad societal perspective which is useful when engaging with people outside of the health sector such as the Ministry of Finance or external funders. The country examples below highlight that the elimination of hepatitis B and C are not only cost-effective they will save health system resources.